Welcome to Dancehall Vocals – a multi-format vocal library featuring over 1100 original vocal samples from some of the biggest names in reggae and dancehall sourced entirely from specially recorded pro vocal performances all recorded in pristine 24bit audio. The library is 100% authentic. Fourteen dancehall and ragga superstar singers performed original tracks. Their vocal performances were then edited into usable phrases. All the vocalists are world-class performers at the top of their game and include the late, great Junior Murvin, Chuck Fender, Merciless, Anthony B, Terry Ganzie, Junior Saw, Pinchers, Junior Demus, Buccaneer, Fantan Mojah, Mojo Herb, Tru Blacks, Lexxus and Warrior King as well as the inimitable Don Goliath. 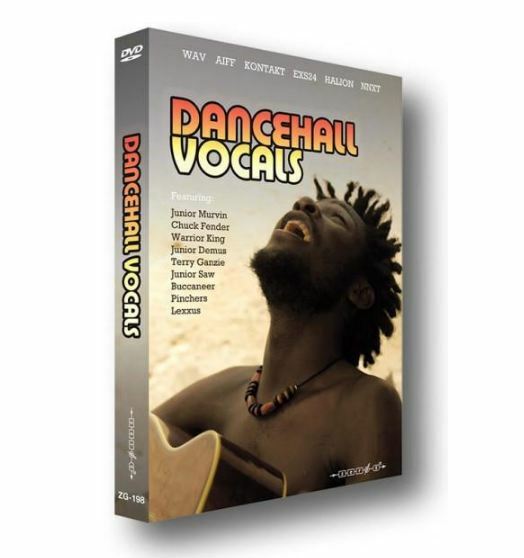 These vocal samples will work brilliantly within any dancehall, ragga or dub track but will also work equally well in all types of dance music when some authenticity is required and a quality vocal performance is what you are looking for. All the vocal phrases have been edited to precise bpm and the 1100 samples are in both Acidized Wav and Apple loop file format all recorded in stunning 24bit using high fidelity recording equipment. EXS24, Kontakt, HALion and NN-XT instruments are also included for ease of use in adding the sounds to your favourite sampler. All the samples in this library are 100% original and royalty-free for your musical use without any additional licensing fees. There are over 950 MB of samples in total, all programmed to work in your favourite music software.